The original and the best. Coloured three dial lock from the Travel Sentry? range that allows US customs to safely and securely examine your luggage ? and not anybody else! Assorted colours available. Allows only American security personnel to examine bag without damaging this lock Functions identically to a conventional combination padlock Recognised by American Travel Security Administration (TSA) Size: H40 x W30 x D13mm Composition = steel / abs plastic / zinc alloy INSTRUCTIONS: ? Spin the shank around 90 degrees from the opening position and depress. ? Keep the shank depressed in this position and move the dials to your desired personal combination code. ? Then lift the shank and turn it back 90 degrees to the original position and depress. ? To lock the padlock move the dials on to any different numbers, the shank should then be secured in place. ? 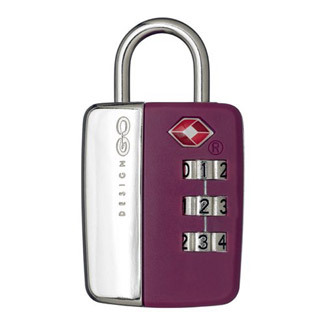 To open the padlock simply move the dials back to your chosen personal combination code and the shank will be released.